"Graphics card" redirects here. It is not to be confused with Graphics processing unit. A video card (also called a display card, graphics card, display adapter or graphics adapter) is an expansion card which generates a feed of output images to a display (such as a computer monitor). Frequently, these are advertised as discrete or dedicated graphics cards, emphasizing the distinction between these and integrated graphics. The majority of modern video cards are built with either AMD-sourced or Nvidia-sourced graphics chips. (Until 2000, 3dfx Interactive was also an important, and often groundbreaking, manufacturer.) Most video cards offer various functions such as accelerated rendering of 3D scenes and 2D graphics, MPEG-2/MPEG-4 decoding, TV output, or the ability to connect multiple monitors (multi-monitor). Video cards also have sound card capabilities to output sound - along with the video for connected TVs or monitors with integrated speakers. Graphics cards weren't very useful for early computers, since they didn't have the capability to run graphic-based games or high resolution videos as modern computers do now. As an alternative to the use of a video card, video hardware can be integrated into the motherboard or the CPU. Both approaches can be called integrated graphics. 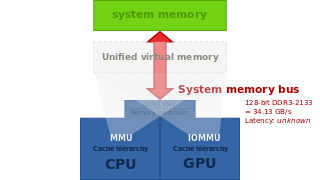 Motherboard-based implementations are sometimes called "on-board video" while CPU-based implementations are known as accelerated processing units (APUs). Almost all desktop computer motherboards with integrated graphics allow the disabling of the integrated graphics chip in BIOS, and have a PCI, or PCI Express (PCI-E) slot for adding a higher-performance graphics card in place of the integrated graphics. The ability to disable the integrated graphics sometimes also allows the continued use of a motherboard on which the on-board video has failed. Sometimes both the integrated graphics and a dedicated graphics card can be used simultaneously to feed separate displays. The main advantages of integrated graphics include cost, compactness, simplicity and low energy consumption. The performance disadvantage of integrated graphics arises because the graphics processor shares system resources with the CPU. A dedicated graphics card has its own random access memory (RAM), its own cooling system, and dedicated power regulators, with all components designed specifically for processing video images. Upgrading to a dedicated graphics card offloads work from the CPU and system RAM, so not only will graphics processing be faster, but the computer's overall performance may also improve. Beyond the enthusiast segment is the market for professional video cards for workstations used in the special effects industry, and in fields such as design, analysis and scientific research. Nvidia is a major player in the professional segment. In November, 2013, AMD introduced a so-called "Supercomputing" graphics card "designed for data visualization in finance, oil exploration, aeronautics and automotive, design and engineering, geophysics, life sciences, medicine and defense." As the processing power of video cards has increased, so has their demand for electrical power. Current high-performance video cards tend to consume a great deal of power. For example, the thermal design power (TDP) for the GeForce GTX TITAN is 250 Watts. While CPU and power supply makers have recently moved toward higher efficiency, power demands of GPUs have continued to rise, so the video card may be the biggest electricity user in a computer. Although power supplies are increasing their power too, the bottleneck is due to the PCI-Express connection, which is limited to supplying 75 Watts. Modern video cards with a power consumption over 75 Watts usually include a combination of six-pin (75 W) or eight-pin (150 W) sockets that connect directly to the power supply. Providing adequate cooling becomes a challenge in such computers. Computers with multiple video cards may need power supplies in the 1000 W - 1500 W range. Heat extraction becomes a major design consideration for computers with two or more high end video cards. Video cards for desktop computers come in one of two size profiles, which can allow a graphics card to be added even to small-sized PCs. Some video cards are not of usual size, and are thus categorized as being low profile. Video card profiles are based on width only, with low-profile cards taking up less than the width of a PCIe slot. Length and thickness can vary greatly, with high-end cards usually occupying two or three expansion slots, and with dual-GPU cards -such as the Nvidia GeForce GTX 690- generally exceeding 10" in length. Some graphics cards can be linked together to allow scaling of the graphics processing across multiple cards. This is done using either the PCIe bus on the motherboard, or, more commonly, a data bridge. Generally, the cards must be of the same model to be linked, and most low power cards are not able to be linked in this way. AMD and Nvidia both have proprietary methods of scaling, CrossFireX for AMD, and SLI for Nvidia. Cards from different chipset manufacturers, architectures cannot be used together for multi card scaling. If a graphics card has different sizes of memory, the lowest value will be used, with the higher values being disregarded. Currently, scaling on consumer grade cards can be done using up to four cards. The device driver usually supports one or multiple cards, and has to be specifically written for an operating system. Video card shipments totaled 14.5 million units in the third quarter of 2013, a 17% fall from Q3 2012 levels. The traditional PC market is shrinking as tablet computers and smartphones gain share. Years ago, the move to integrated graphics on the motherboard greatly reduced the market for low end video cards. Now, AMD and Intel's accelerated processing units, which combine graphics processing with CPU functions on the CPU die itself, are putting further pressure on video card sales. AMD introduced a line of combined processors which it calls the AMD A-Series APU Processors (A4, A6, A8, A10) while Intel, rather than marketing an exclusive line of APUs, introduced its "4th Generation Intel® Core™ Processors", some of which are APUs. Those processors are described as offering "Superb visuals and graphics performance–without the cost of a separate graphics card." They are branded as having Intel HD Graphics or Intel Iris Pro Graphics. As an example, the Intel Core i7 4750HQ with Iris Pro Graphics 5200, an accelerated processing unit for notebook computers, allows users with mid-range graphics requirements to use a notebook computer without a video card. In a September, 2013 review of the Intel Core i7 4750HQ accelerated processing unit (which is closely related to the Intel processor with HD Graphics 5000 used in the MacBook Air,) the website hardware.info stated: "With its latest generation of integrated graphics, Intel set out to rival the performance of the mid-range mobile Nvidia GeForce GT 650M graphics card. And the tests leave no doubt about it, both 3DMark and the gaming benchmarks confirm that the [Intel] Iris Pro Graphics 5200 is on the same level of or slightly below that of the GT 650M." (The GeForce GT 650M is not sold through retail channels, but an EVGA desktop GTX 650 was selling for around $120 in late 2013.) Although the review notes that Intel's accelerated processing unit is not yet cost competitive, the technology is approaching competitiveness, at least with mid-range mobile dedicated video. (A video benchmarking website that tabulates user-submitted benchmarks shows Intel Iris Pro Graphics 5200, based on a very small sample of 8 submissions, scoring a G3D Mark of 912, versus 1296 for the Nvidia GeForce GT 650M, with higher scores being better. If the benchmark is linear, that puts the Iris Pro Graphics 5200's performance at about 70% of the GeForce GT 650M Intel was targeting. AMD's A10-5750M mobile APU with Radeon HD 8650G graphics scores 858 on this graphics benchmark.) With anticipated price reductions, it is predicted that APUs will eventually replace low to mid-range dedicated video implementations. That will leave only the high-end enthusiast and professional market segments for video card vendors. A Radeon HD 7970 with the heatsink removed, showing the major components of the card. A heat sink is mounted on most modern graphics cards. A heat sink spreads out the heat produced by the graphics processing unit evenly throughout the heat sink and unit itself. The heat sink commonly has a fan mounted as well to cool the heat sink and the graphics processing unit. Not all cards have heat sinks, for example, some cards are liquid cooled, and instead have a waterblock; additionally, cards from the 1980s and early 1990s did not produce much heat, and did not require heatsinks. The video BIOS or firmware contains a minimal program for initial set up and control of the video card. It may contain information on the memory timing, operating speeds and voltages of the graphics processor, RAM, and other details which can sometimes be changed. The usual reason for doing this is to overclock the video card to allow faster video processing speeds, however, this has the potential to irreversibly damage the card with the possibility of cascaded damage to the motherboard. The RAMDAC, or Random Access Memory Digital-to-Analog Converter, converts digital signals to analog signals for use by a computer display that uses analog inputs such as Cathode ray tube (CRT) displays. The RAMDAC is a kind of RAM chip that regulates the functioning of the graphics card. Depending on the number of bits used and the RAMDAC-data-transfer rate, the converter will be able to support different computer-display refresh rates. With CRT displays, it is best to work over 75 Hz and never under 60 Hz, in order to minimize flicker. (With LCD displays, flicker is not a problem.) Due to the growing popularity of digital computer displays and the integration of the RAMDAC onto the GPU die, it has mostly disappeared as a discrete component. All current LCD/plasma monitors and TVs and projectors with only digital connections, work in the digital domain and do not require a RAMDAC for those connections. There are displays that feature analog inputs (VGA, component, SCART etc.) only. These require a RAMDAC, but they reconvert the analog signal back to digital before they can display it, with the unavoidable loss of quality stemming from this digital-to-analog-to-digital conversion. With VGA standard being phased out in favor of digital, RAMDACs will begin to disappear from video cards. Video Graphics Array (VGA) (DE-15). Also known as D-sub, VGA is an analog-based standard adopted in the late 1980s designed for CRT displays, also called VGA connector. Some problems of this standard are electrical noise, image distortion and sampling error in evaluating pixels. Today, the VGA analog interface is used for high definition video including 1080p and higher. While the VGA transmission bandwidth is high enough to support even higher resolution playback, there can be picture quality degradation depending on cable quality and length. How discernible this quality difference is depends on the individual's eyesight and the display; when using a DVI or HDMI connection, especially on larger sized LCD/LED monitors or TVs, quality degradation, if present, is prominently visible. Blu-ray playback at 1080p is possible via the VGA analog interface, if Image Constraint Token (ICT) is not enabled on the Blu-ray disc. Digital-based standard designed for displays such as flat-panel displays (LCDs, plasma screens, wide high-definition television displays) and video projectors. In some rare cases high end CRT monitors also use DVI. It avoids image distortion and electrical noise, corresponding each pixel from the computer to a display pixel, using its native resolution. 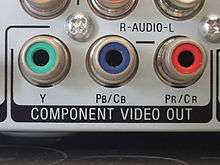 It is worth noting that most manufacturers include a DVI-I connector, allowing (via simple adapter) standard RGB signal output to an old CRT or LCD monitor with VGA input. ISA: Introduced in 1981 by IBM, it became dominant in the marketplace in the 1980s. It was an 8 or 16-bit bus clocked at 8 MHz. In the attached table is a comparison between a selection of the features of some of those interfaces. Computer display standards - a detailed list of standards like SVGA, WXGA, WUXGA, etc. 1 2 3 4 "Add-in board-market down in Q2, AMD gains market share [Press Release]". Jon Peddie Research. 16 August 2013. Retrieved 30 November 2013. 1 2 Crijns, Koen (6 September 2013). "Intel Iris Pro 5200 graphics review: the end of mid-range GPUs?". hardware.info. Retrieved 30 November 2013. ↑ "Designed for Big Data Applications, AMD Announces Industry's First "Supercomputing" Server Graphics Card with 12GB Memory [Press Release]". AMD. 14 November 2013. Retrieved 30 November 2013. ↑ "Introducing The GeForce GTX 780 Ti". Retrieved 30 November 2013. ↑ "Faster, Quieter, Lower: Power Consumption and Noise Level of Contemporary Graphics Cards". xbitlabs.com. ↑ "Video Card Power Consumption". codinghorror.com. ↑ Maxim Integrated Products. "Power-Supply Management Solution for PCI Express x16 Graphics 150W-ATX Add-In Cards". ↑ "What is a Low Profile Video Card?". wiseGEEK. ↑ "Best 'low profile' graphics card". Tom's Hardware. ↑ "GTX 690 | Specifications". GeForce. Retrieved 2013-02-28. ↑ "SLI vs. CrossFireX: The DX11 generation". techreport.com. ↑ Adrian Kingsley-Hughes. "NVIDIA GeForce GTX 680 in quad-SLI configuration benchmarked". ZDNet. ↑ "Head to Head: Quad SLI vs. Quad CrossFireX". Maximum PC. 1 2 "Graphics Card Market Up Sequentially in Q3, NVIDIA Gains as AMD Slips". Retrieved 30 November 2013. 1 2 Chen, Monica (16 April 2013). "Palit, PC Partner surpass Asustek in graphics card market share". DIGITIMES. Retrieved 1 December 2013. ↑ "4th Generation Intel® Core™ Processors Are Here". Intel. Retrieved 1 December 2013. ↑ "EVGA 01G-P4-2650-KR GeForce GTX 650 1GB 128-bit GDDR5". newegg.com. Retrieved 1 December 2013. ↑ "G3D Mark for Intel Iris Pro 5200". PassMark Software. Retrieved 1 December 2013. 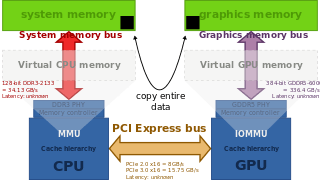 ↑ "G3D Mark for GeForce GT 650M". PassMark Software. Retrieved 1 December 2013. ↑ "G3D Mark for Radeon HD 8650G". PassMark Software. Retrieved 1 December 2013. ↑ NVIDIA GTX Titan X. ↑ Shaikh, Sameer (October 12, 2015). Complete Computer Hardware Only. PediaPress. p. 114. ↑ "HDMI FAQ". HDMI.org. Retrieved 2007-07-09. ↑ "DisplayPort Technical Overview" (PDF). VESA.org. January 10, 2011. Retrieved 23 January 2012. ↑ "FAQ Archive - DisplayPort". VESA. Retrieved 2012-08-22. ↑ "The Truth About DisplayPort vs. HDMI". dell.com. ↑ "Video Signals and Connectors". Apple. Retrieved 29 January 2016. ↑ "How to Connect Component Video to a VGA Projector". AZCentral. Retrieved 29 January 2016. ↑ "Quality Difference Between Component vs. HDMI". Extreme Tech. Retrieved 29 January 2016.